Grand in both size and appearance, this sprawling 96 square residence, nestled on a rare 2,302m2 block boasts a fusion of luxury Hamptons and European style as well as delivering large scale living and entertaining options. Take advantage of the gourmet kitchen, showcased by an oversized Calacatta marble island bench and acclaimed appliances, a temperature controlled wine cellar, sunken formal lounge and dining, large scale home cinema, smart home automation, an executive office as well as expansive bedrooms, all of which are accommodated by elegant ensuites. Theres also a fully equipped guest wing which features a marble kitchen, ensuited bedroom and living quarters. 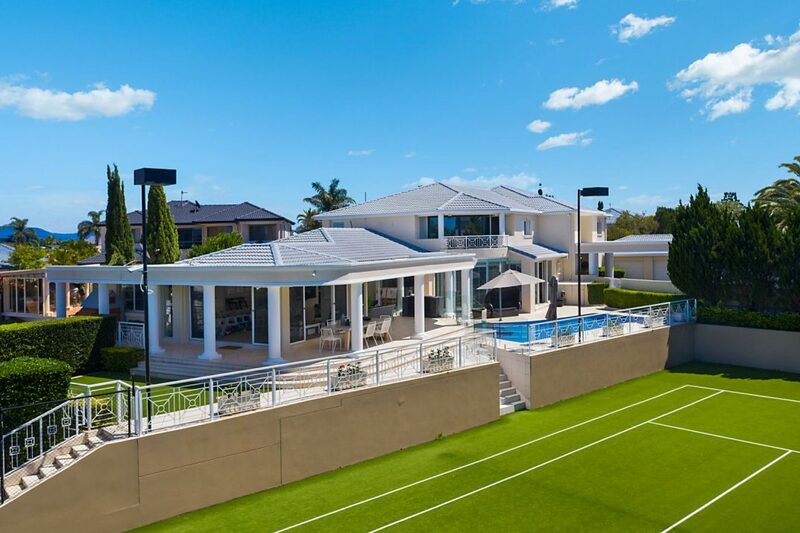 Mere moments from Main River, its sheltered waters host a boat ramp, boat shed, and floating pontoon, while the manicured grounds also accommodate a championship sized tennis court, inground pool and an enviable alfresco terrace with built-in kitchen. A secluded and stately sanctuary, its tucked away behind mature, landscaped gardens and promises to deliver you the resort style lifestyle you seek. Full smart home automation and surround sound speakers wired to every corner of the estate. Perched at the end of a peaceful cul-de-sac, and in one of the Gold Coasts best kept secrets in waterfront living, youll also appreciate being 15 minutes from Pacific Fair, as well as central to elite schools, All Saints, Emmanuel, TSS and St. Hildas. Act now and inspect this rare, oversized residence of distinction today. Block Shock: the secret behind Hayden & Sara's win (or why the best apartment on The Block came last).